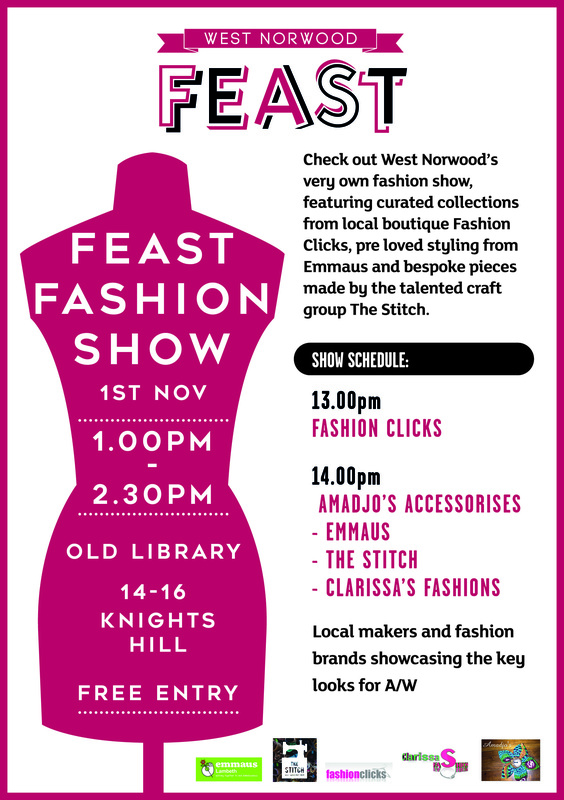 Fashionistas & Fireworks @westnorwoodfeast.com Feast Sunday 1 November! Kick up those heels at Fashion Feast! It’s all about fabulous frocks and fireworks this Feast. Our volunteers have pulled together the finest outfits in West Norwood, put them on well rehearsed models and are ready to give you not one, but TWO fashion shows in the Old Library on Knights Hill! The sporting of dark glasses, fedoras and pouts is a must. 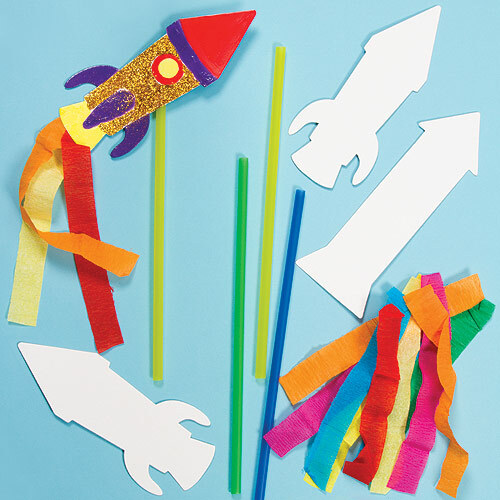 …or if your nippers fancy getting busy with balloons, paint and black paper, take them up the the Family hub at the leisure centre where they can make a communal piece of splatted firework art. If all that is just far too much mess and stickiness, you could just colour in some drawings of fireworks. 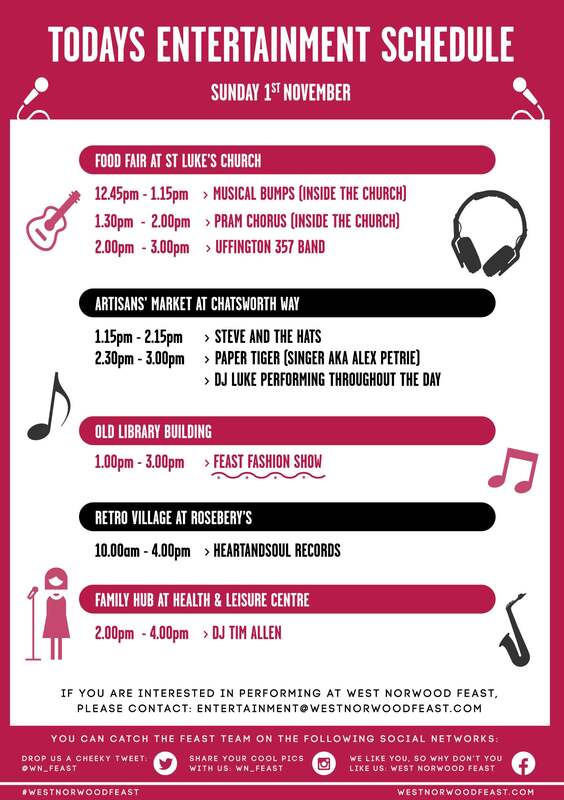 We do have that option, too.There’s free stuff for kids going on inside St Luke’s from both Musical Bumps and the cheery ladies from Pram Chorus as well as our regular Feast favourites (see entertainment schedule below). And if that weren’t enough, Mambista DJ Jerry Lyseight will be spinning Latino, African and jazz beats up at Family Hub. Retro will be back in its proper place, along with the Sunday papers and board games in the carpark at Rosebery’s. They’ll have upcycled furniture from Dolly Did It, cupcake decorating for the kids from Lovesome Cake and Rosebery’s painting and jewellery specialist is on hand to answer questions about your treasures. Portico will have its bazaar going on so pop in on your way down Knights Hill.Dixie Union, an old Feast favourite will be at the leisure centre’s Family hub along with a couple of oriental street food newbies Hao Hoa Chi and Pochi – be sure to try them out! 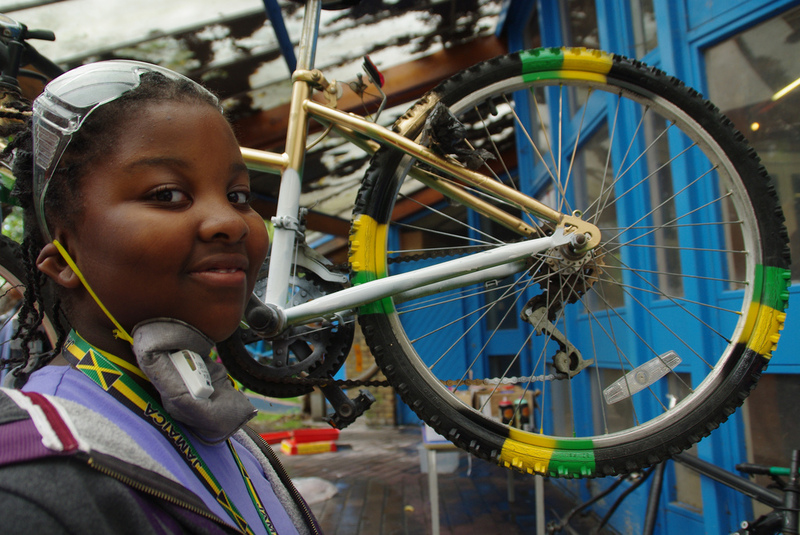 Dr Bike will be by the bike sheds (not behind them, sadly) and we have a new stall by these Bling Ya Bike folks, whose young entrepreneurs will be selling cool bike related products that they’ve made. Another children’s matinee coming up, this time it’s Shaun the Sheep on Saturday 7 November. Not strictly a matinee as it’s at 11am… but that’s the time you parents said you’d like to take your mites to the flicks and we aim to please. At £5 for adult and £2 for accompanied kid, that’s fairly pleasing, no? For the grown ups there’s an open mic poetry evening later in the month with the film of Gingsberg’s Howl, trailer here. If you want to get the newsletter from Feast film nights (or matinees that aren’t matinees), sign up here. How about this as a Feast success story? Michael started out by selling records at Feast, he opened the Book & Record Bar in West Norwood and he’s made it onto the Guardian’s list of top record shops in the country! PrevPreviousFashion Feast, Sunday 1 November!